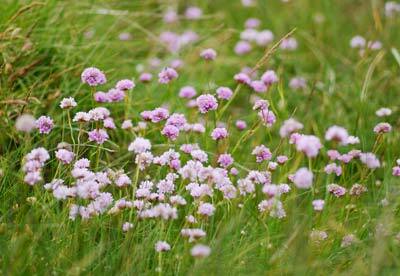 Thrift (or Sea Pink) is one of the loveliest flowers of the seaside. The bulk flower in May and June, when they make for a great display out on the saltmarshes, but some persist right through the summer and I have even seen it in bloom in January - global warming indeed! It's name is probably connected with an old-fashioned meaning for thrift, ' vigorous thriving or growth', for this is a tough plant, well adapted to harsh conditions, that thrives in the mountains as well as by the sea.